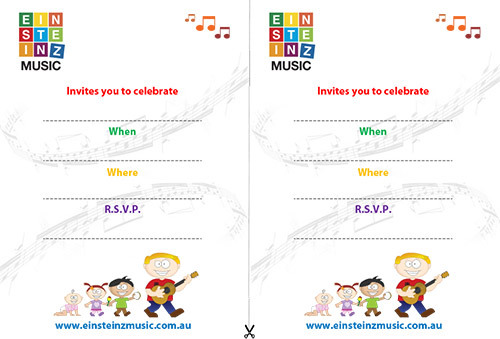 For the same price as having a jumping castle, magician, fairy, clown or superhero, you could have an Einsteinz Music teacher run an intimate, unique and interactive music session with your child’s party guests. The children will have lots of fun with the added bonus of it being educational. A professional musician will lead the session, entertaining the children by making music with them. The children will sing familiar songs, learn new ones and will play percussion instruments like maracas, tambourines and rhythm sticks (except for babies). All parties end with a jam session on the drums…which leads into the ‘Happy Birthday’ song and cake! The party music sessions are upbeat and high-energy – they are lots of fun for the children as they are interactive and hands-on, rather then a “show”. The cost is $275 (inc GST) for up to 15 children. If it is a combined party, please add an extra $20 to the party price. A present for the birthday child, (one child). We had a lovely party for Neta today, the kids and the parents enjoyed Chris, he was funny and made the kids laugh as well as singing and dancing.